So finally the king of all the flagship devices is out that is Apple has announced iPhone of this year. 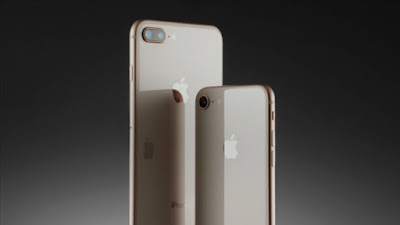 This year Apple not only announced two iPhones but there is one more variant as this is the 10th anniversary of iPhones. Apple announced these phones in an event held at Steve Jobs theater. Every year all the tech enthusiasts are excited about the new iPhones and time has come. I know there are many questions in your mind about these new iPhones, what is their design?, how will they perform?, what extra new features? and many more, so without wasting further time let's see what are the specifications of this year iPhone. This year is the 10th anniversary of iPhone that's why, Apple announced three iPhones this year. The two are successors to the regular iPhone 7 and 7 Plus that are iPhone 8 and 8 Plus. 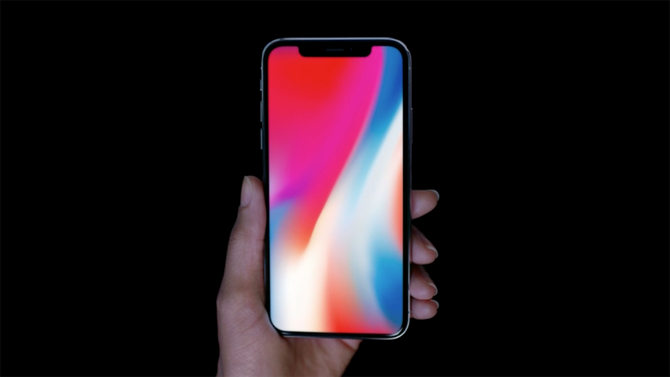 There is one more special iPhone which is known as iPhone X. So basically the three new iPhones are iPhone 8, iPhone 8 Plus and iPhone X. This iPhone X will have some special features than iPhone 8 and 8 Plus. 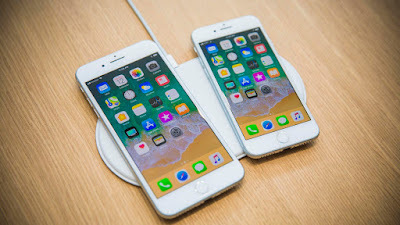 So let's see what are the specifications of these three iPhones and what new and extra features, Apple is providing this year in their new iPhones. The most interesting among these three is iPhone X, so first let's discuss about this. The design of the iPhone X this year is really great. This year there is a considerable change in the design of the iPhone. 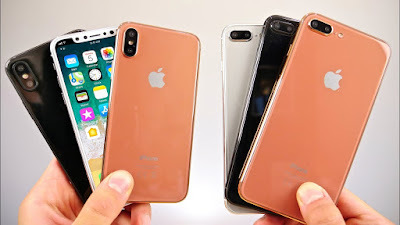 From last two or three iPhones the design of the iPhone remains same which looks really boring. The first noticeable difference is the display of the device. iPhone X is having an edge to edge OLED panel. Yes, you read it right Apple is going with OLED panels this year. Edge to edge display means the bezels of the phone are very thin and the aspect ratio of the display is 18:9. Apple is calling this display Super Retina display. Also there is a cut out at the top of the display for sensors and front camera. The resolution of the display is 2436*1125 resolution. This is the first iPhone to have an OLED display. So the display looks very good. The size of the display is 5.8 inch, but the phone will be easy to use with one hand as it has more screen to body ratio, it isn't as big as a 5.8 inch phone. The back of the iPhone X is made of glass just like Samsung Galaxy S8 or Note 8, which make the looks of the phone very good. So the phone looks really premium with this glass back and cool display. As this phone has glass back it will also support wireless charging. Also there is a side button available which can be used to talk to Sri by just holding it. Instead of glass at front and back, there is a metallic band around the sides of the phone for better grip and shinny look. This time iPhone X is water and dust resistant. But one thing to note is that iPhone X isn't having any physical Home Button. So how to unlock the phone and what about security of the phone? The screen awake just with a single tap at any part of the screen. Let's discuss this in the later part. The 3D touch is also available on the phone's display. As iPhone X doesn't have any Home Button so there isn't any touch ID but iPhone X is having face ID new feature which can unlock the phone by just looking at it. There are various sensors such as Flood illuminator, infrared camera, front camera and dot projector on the cut out at the top which helps in unlocking the device with face recognition. This whole system is known as True Depth Camera system. When we look at the camera it fires thousands of infrared dots, the camera fires and it checks the pattern against the stored image in the real time. It involves multiple neural actions. There is a neural engine involved in the device which helps in enabling this Face ID recognition. So according to company this technology is really accurate and fast due to this dual core neural engine. Also according to Apple it adapts to our face from time to time, it even unlocks the phone if grew beard, wear a cap and take a haircut. And also it can't be spoofed by photographs. It also works with Apple Pay just we have to look at the device. One another cool feature of this Face ID is Animojis. 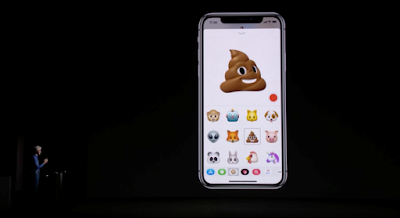 Animojis are animated emojis which can do some gestures according to our gestures. Yes we can create emojis by making any face gesture or saying something, whatever we want them to. But just something which we have to do is just do or say the same thing which we want them to. Our this activity is very easily detected by face ID and thus the Animojis are created. I know this isn't looking too cool as by reading this but really this looks very cool when we see the video. 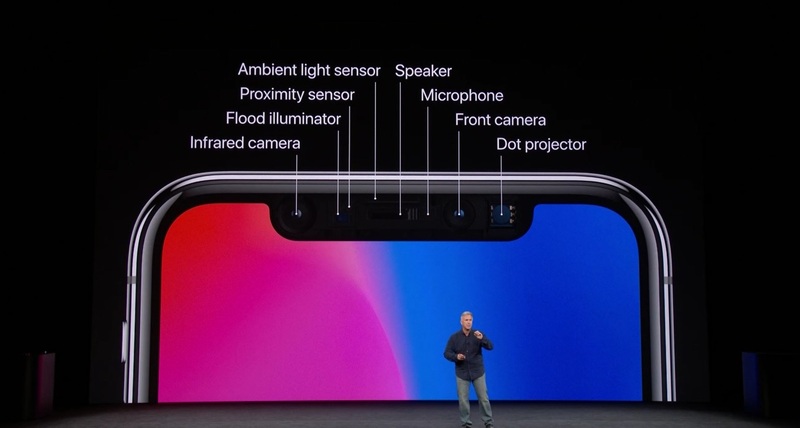 The rear camera setup of iPhone X is dual rear camera. The camera setup is same as present on iPhone 7 Plus which involves one normal lens and other a telephoto lens. This has 12MP dual rear camera, with f/1.8 aperture normal lens and a f/2.4 aperture telephoto lens. This telephoto lens helps in 2x optical zoom and portrait shots. Yes 2x optical zoom is present with zero loss quality. The optical image stabilization is present in both the lens. Also there is quad LED flash present for low light photographs. Also there is a dedicated portrait mode for depth in feel shots. The camera can record 4K videos upto 60fps and full HD videos upto 240fps. 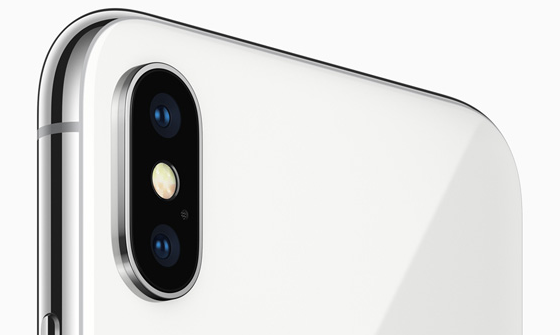 On front iPhone X has 7MP camera with f/2.2 aperture lens. The new feature which this dual camera setup can do is Portrait lightening, the dual cameras sense the depth and rework the lightening while we compose the shot. There is a new menu from which we can select the lightening on our face, these aren't filters. This is real time analysis of light on our subject's face. It looks cool. 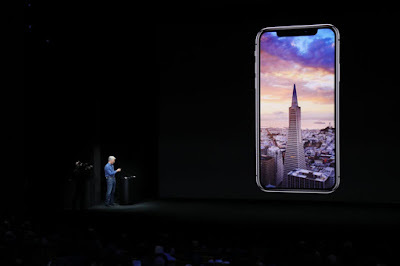 Apple iPhone X is powered by Apple A11 Bionic chipset. This chipset is based on Hexacore processor which has two performance cores and four high efficiency cores. This is built on 64-bit design. We all know that iPhones are always fastest flagship phones of the year. And this legacy will maintain here too. It will perform all the tasks without any issues. It can do any task whatever we throw to it. So also there won't be any issues regarding any high graphic intensive tasks as the device is packed with very good performance GPU. There is no worry regarding the performance of the iPhones, they always perform very well. A11 also has a new image processor with faster low light autofocus and new hardware noise reduction. iPhone X comes with 3GB of RAM. But the RAM amount doesn't matter for Apple, it does optimization in such a way that all apps run butter smooth. 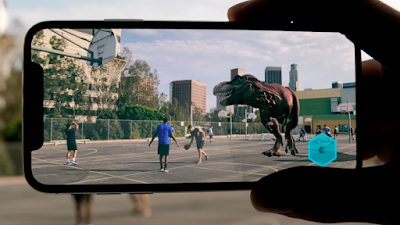 Yes the new iPhone X also supports Augmented Reality. This is the first iPhone to have Augmented Reality. The cameras, gyroscopes, accelerometer and other sensors work together to make this a AR smartphone. CPU, GPU and image sensors are also calibrated for AR. There are a lot of AR based games touted by Apple at the event like Sky Guide, Atli Mar from Directive Games and many more. It will be really interesting to play all these games in the AR world while we still are in the same world but it definitely changes the environment around us. But there will be special AR Kit from Apple which need to be bought separately. But it will be a fun to wave your phone in front of your face playing a game. All these things are shown by Apple at the event, but it is still unknown how much effective will all these things be in the real life. Now let's talk about wireless department on iPhone X. iPhone X has Bluetooth 5.0 and glass back for wireless charging. 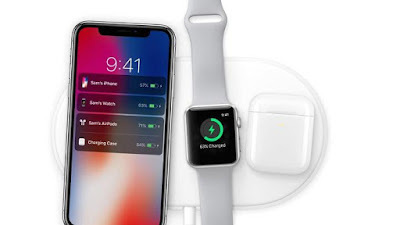 Yes there will be charging pads for charging the phone without any cable and all, just we have to keep our iPhone there at these pads. iPhone X also supports Qi standard. Qi is an open interface standard developed by the wireless pore consumption for inductive charging upto a distance of 4 cm. This system uses a charging pad and a compatible device which is placed on top of the pad charging via resonant inductive coupling. And nowadays these pads are available at all public places in US for charging smartphones such as Restaurant, Airports, Cafés, Office and many more. So iPhone X can be charged at all the places even if you are not carrying your charger. Now let's talk about the pricing of iPhone X, it's price will start from $999 in US for 64GB model. 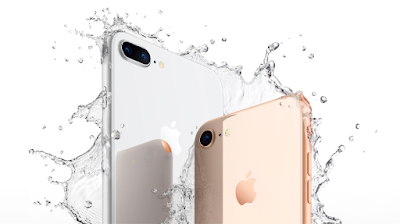 Instead of iPhone X, Apple also released two other iPhones this year that are iPhone 8 and iPhone 8 Plus. The design of these iPhones is same as that of last year launched iPhone 7 and 7 plus. The only difference is that these have glass back instead of metallic. A steel band runs around the sides of both the devices. iPhone 8 has 4.7 inch of screen while iPhone 8 plus has 5.5 inch screen. These displays are of IPS LCD type. The resolution of display on iPhone 8 plus is 1080*1920 pixels while on iPhone 8 is 750*1334 pixels. As both phones have glass backs they both support wireless charging. Both these iPhones are dust and water resistant with IP67 rating. iPhone 8 and iPhone 8 plus has the same displays as previous year iPhones, which means that it is not having an edge to edge display like iPhone X, so it retains the Home button from apple. 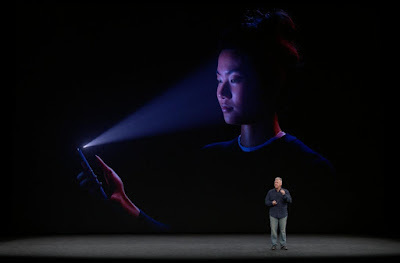 It is also having touch ID for unlocking the device which means that it isn't having face ID like iPhone X. Both these iPhones are powered by Apple A11 Bionic chipset as that of iPhone X. Thus chipset is based on hexa core processor with 2 Monsoon cores and 4 Mistral cores. Also the GPU is better than previous generation GPU. So there won't be any issue regarding the performance of the devices. But iPhone 8 comes with only 2GB RAM while iPhone 8 Plus has 3GB of RAM. 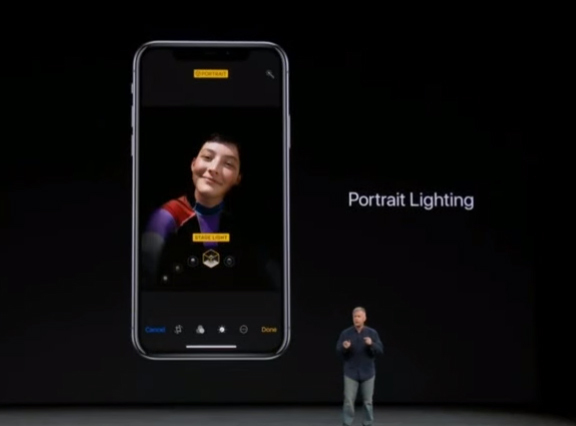 Now let's talk about the cameras, iPhone 8 plus has the same dual camera as that on iPhone X. iPhone 8 plus is having the lightening portrait mode and lightening effects just like iPhone X. While iPhone 8 has one single rear camera lens of 12MP with f/1.8 aperture size. This also has Optical Image Stabilization. iPhone 8 isn't having this these portrait lightening and other lightening effects like iPhone 8 and iPhone X as this isn't having dual rear camera which helps in depth in feel effects. Both these phones support Augmented Reality features just like iPhone X. So this is a nice thing. Both these phones support wireless charging just like iPhone X, as these have glass back. They also support Qi charging. iPhone 8 plus has 2675 mah battery while iPhone 8 is having 1821 mah battery. Both these phones support quick charging about which apple is claiming that can charge the battery upto 50% in 30 minutes. These two iPhones will come in three colors that are Gold, Space Grey and Silver. iPhone 8's price will start from $699 and iPhone 8 plus from $799 both for 64GB model.